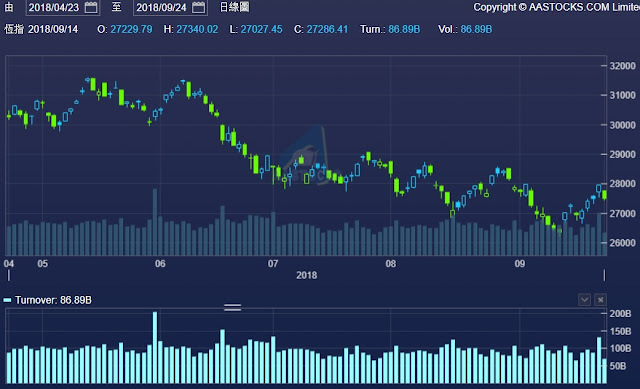 Hong Kong Hang Seng Index rebounded to close to 28,000 points last week and stopped pedestrians. They once again fell 450 points on Monday. It seems that this wave of rally has ended. In the past two months, we have repeatedly repeated the trend of falling, rebounding, falling and rebounding. However, the trend of the market is basically a wave below a wave. The bottom of the previous wave is close to the 26,000 mark. If the trend is repeated, The chance of falling below 26,000 points is not low. This entry was posted in Investment and tagged HSI on 26 September, 2018 by Wai Gor.